Can you solve this word puzzle?Can you solve this word puzzle? 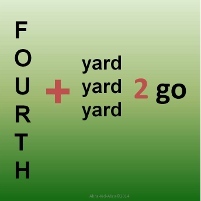 Can you solve this word puzzle? Answer: 4th down and 3 yards to go. Speaking of 4th down, be sure to sign up for winter break camp before time runs out! Magic, circus, comedy. Learn new skills develop presentation skills & confidence. Have fun!